As gentle as detangling with your fingers. 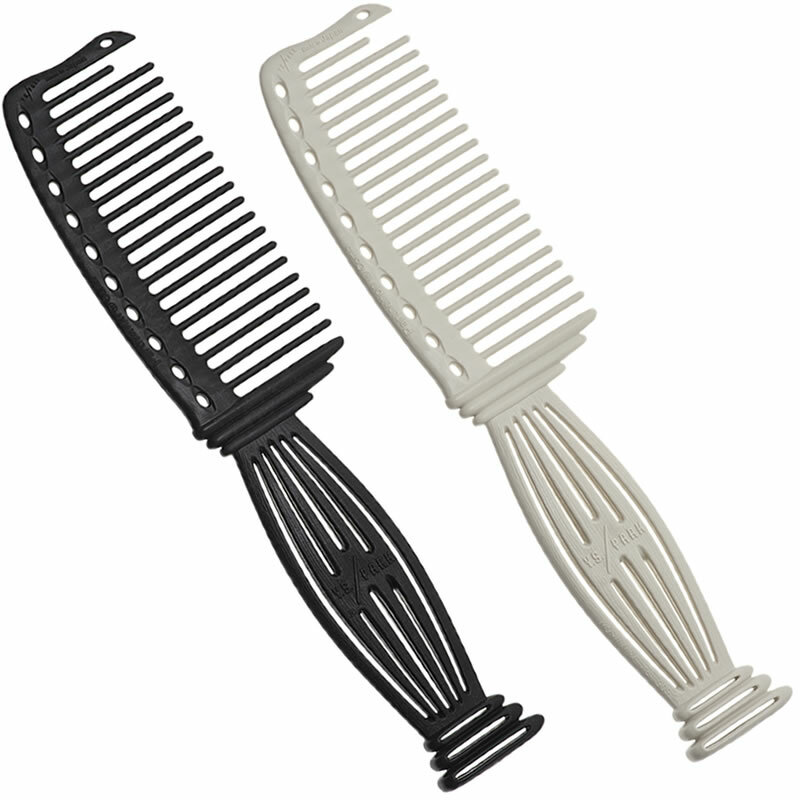 The YS Park 606 Parthenon is the final word in detangling combs featuring a damage-free action that's as gentle as using your fingers. It's perfect for use to prep hair both before and after washing and also works as a colour comb for even coverage. Like other YS Park combs, it features a graduated pitch to its teeth which gives you great control and means you can also use it as a jumbo cutting comb. The tapered foot end is perfect for blocking and there's a shortened first tooth for easy parting. Add to that rounded teeth tips that minimise irritation on sensitised skin and 1-cm spaced holes on the spine for easy section measurement and it's easy to see why the YS Park 606 will quickly become your first choice detangler. It's available in 2 colours: Black or White. £15.00 (inc. VAT) Why no VAT? We're a trade wholesaler and quote our prices without VAT to help our VAT-registered customers understand the true cost of a purchase. Pack of 2, 95-mm-long, aluminium clips in 9 bright colours: Black, Blue, Bronze, Gold, Green, Pink, Purple, Red and Silver. Strong and durable, but light enough not to leave any crimp marks in the hair. Packs of 10 strong aluminium mini clips as used by hairdressing professionals worldwide. Available in Black, Gold, Green, Pink, Silver and Assorted Colours (2 each of pink, green, black, silver, and gold). Lightweight aluminium clip measuring 106 mm and designed for incredible grip to allow sectioning of thin panels even in short hair. Comes in 10 colours: Black, Dark Blue, Gold, Green, Light Blue, Orange, Pink, Purple, Red or Silver.